Mega Sale! Free Shipping Included! Save 24% on the Westinghouse 7861400 Industrial 56-Inch Three-Blade Indoor Ceiling Fan, Brushed Nickel with Brushed Nickel Steel Blades by Westinghouse Lighting at Result BD. MPN: 7861400. Hurry! Limited time offer. Offer valid only while supplies last. The durable Westinghouse Industrial 56-Inch Three-Blade Indoor Ceiling Fan is designed for commercial, industrial or larger residential spaces. 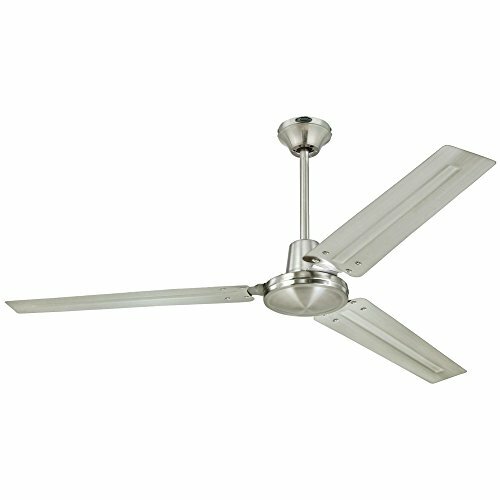 The durable Westinghouse Industrial 56-Inch Three-Blade Indoor Ceiling Fan is designed for commercial, industrial or larger residential spaces. Well-recognized for its modern, mechanical appeal, the Industrial fan has a sleek brushed nickel finish, needs minimal assembly and includes a five-speed wall control unit. Perfect for workshops, high ceiling great rooms, two-story entryways and lofts. Intended to circulate air more powerfully than standard ceiling fans, the industrial fan must be hung at least 10 feet above the floor. This fan creates a comfortable environment for any activity, providing excellent airflow of up to 5,973 cubic feet per minute (cfm). It efficiently operates at 62 watts on high speed, giving it an airflow efficiency rating of 97 cfm per watt. The Westinghouse Industrial fan is backed by a 15-year limited warranty on the motor and a 2-year warranty on all other parts. Westinghouse is a trusted, global brand. Westinghouse knows lighting and offers products with exceptional quality, reliability and functionality. Product reference number 78614.